​​​​ Several new apartment complexes are coming to Northwest Austin, ranging from luxury developments near The Domain to affordable housing near Capital Metro’s Lakeline Station. In second quarter 2016, the Northwest Austin area saw 824 new units, according to the most recent figures from ApartmentTrends.com. 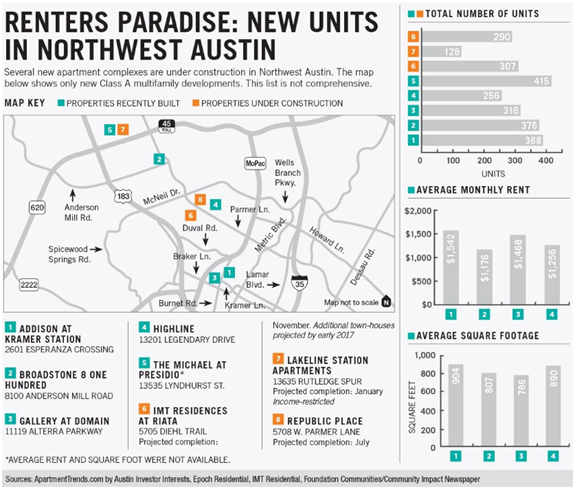 Northwest Austin is expected to see 3,091 new units start construction and 3,381 units finish construction through second quarter 2017, according to the data. Several new developments are underway or already available to lease in Northwest Austin, including The Michael at Presidio at 13535 Lyndhurst St., near Lakeline Mall. It is a 415-unit apartment and townhome complex. Nonprofit Foundation Communities expects its Lakeline Station Apartments at 13635 Rutledge Spur will be ready by January 2017. The development will have one-, two- and three-bedroom, income-restricted apartments.